Mugsy's Rap Sheet » Oil Companies using Enron style price fixing. Closing refineries to jack up gas prices. Oil Companies using Enron style price fixing. Closing refineries to jack up gas prices. Gasoline prices hit a new record high Tuesday with the National Average now standing at $3.08 a gallon. The primary reason cited for the rise in gas prices is the high number of oil refineries “Closed for maintenance” (which turn oil into gasoline) just prior to the “Summer driving season”. If this sounds familiar to you, it’s because this is EXACTLY what Enron did, taking advantage of the new California electricity-deregulation laws (pushed through by Republicans in the late 90’s, arguing that it would SAVE consumers money as competition would drive costs down), to manipulate the cost of electricity. Enron closed power-plants and switching stations to create “artificial shortages” then charged exorbitant rates for what power was left. To relieve the strain on the remaining power grid, “rolling blackouts” had to be instituted, leaving many Californians in the dark with no electricity on some of the hottest days of the year. I remember even The Tonight Show with Jay Leno doing an entire show in near total darkness “as a show of support during the energy crisis”. “What’s the difference between California and the Titanic? The sheer contempt Enron’s energy traders had for the people they were swindling made headlines when audio tapes from the trading floor made their way onto the Network News. And now we are seeing it again, only a much larger scale, and with the blessings of the White House. Where Enron created artificial shortages to jack up the price of electricity in a single state by closing power stations, oil companies have been closing refineries for “maintenance” during peak oil demand to manipulate oil prices across the entire country. And the heavily “oil-friendly” Bush Administration has allowed them to get away with it. What do you expect when a former oil-company exec with close ties to the Saudi Royal Family is made President, and the former CEO of one of the largest oil industry support firms in the country (“Halliburton”) is made Vice President? First… keep the “saber-ratting” to a minimum. Nothing can cause the price of oil to spike like uncertainty over the supply due to unrest in the Middle East. For as many as six months prior to the election, the Bush Administration stopped threatening the use of military action against Iran over their nuclear aspirations and began to cite progress via “talks” and “negotiation”. Second… you suspend toping off the National “Strategic Reserve”. In April of 2006, the Bush Administration suspended purchases of oil to supplement the National Strategic Petroleum Oil Reserve, thereby leaving more oil for the consumer market and helping to bring prices down. Third… the oil companies… on their own… at a time when they are seeing the largest corporate profits in history, it is most certainly in their best interests to maintain the status-quo in Washington. While it would be difficult (if not impossible) to prove that the oil companies kept all of their refineries online and output gasoline at a record rate in the months prior to the election in order to glut the market and drive down prices, the evidence seems clear that that is exactly what they did. And now that the election is over, refineries are being shut down, gasoline prices are spiking, and profits are going through the roof a mere six months later. Defenders of the Bush Administration might try to convince you that gasoline prices only climb as the price of oil climbs on the world market. If that were true, the current record price of gasoline should coincide with a record in the per-barrel price of oil. But in fact, oil at its current price of $63 per barrel is well below the record high of $78.40 on July 13, 2006 when gasoline peaked at $3.03 a gallon. 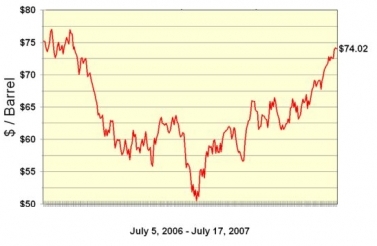 As you can see from the above graph, the price of oil tumbled downwards in the months before the November 2006 election, and have climbed steadily upward ever since. But the price of oil, while far lower than last years record, does not comport with the record high national average price for gasoline. 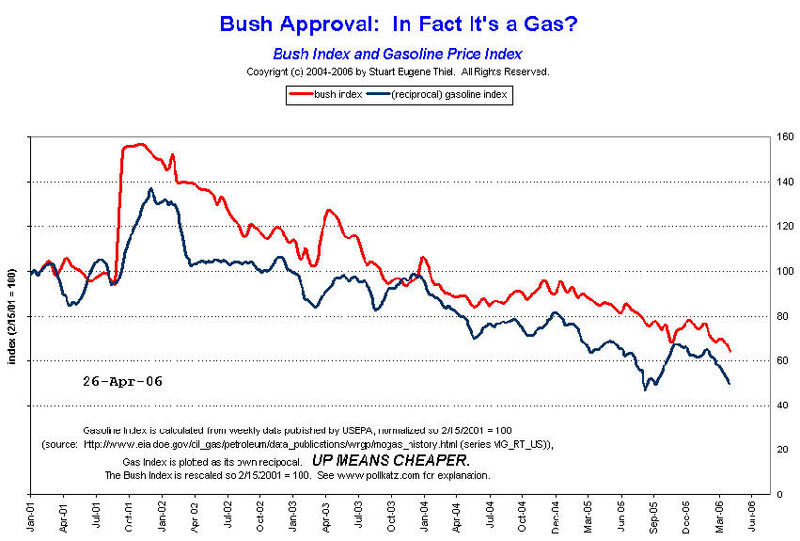 Obviously, something else is effecting the price of gasoline. And that is a lack of supply due to the number of refineries that have been taken off line. Since the November election, the National Average for the price of a gallon of gasoline has risen by as much as $0.85 a gallon. Fortunately, this has prompted some in Congress to call for a Congressional probe into price fixing, but, expect little to come of it. Despite massive evidence of criminal wrongdoing, it took Washington more than 5 years to prosecute Enron for its price fixing and stock manipulation, in which only four people were convicted, one of which (supposedly) died before he could be sentenced (“Kenny Boy” Lay) and another that has yet to be sentenced as he files his appeal. But George W knows what master he serves. What Big Oil giveth, Big Oil can taketh away.